Zone 1 is commonly known as the recovery zone. We don’t think of it as a “training zone” like the rest of them. Usually zone 1 is described as “extremely easy”, “embarrassingly easy”, “gentle”, and “slow”. It’s basically one step above sitting on the couch. None of these words make us feel like we’re getting any work done so we tend to avoid zone 1 because it’s typical descriptors devalue its training worth. Some of the key benefits of zone 1 training include increased endurance, durability, fat utilization, and oxygen efficiency. Training below your aerobic threshold builds capillary pathways that transport oxygen to your muscles, and carries lactate away from your muscles, which is the key to efficiency. The argument for spending a majority of your training time in zone 1 is most effective when paired with minimal training in higher intensity zones (above your anaerobic threshold), rather than staying stuck somewhere in the middle. By spending more time in zone 1, the quality of your training above your anaerobic threshold will improve and you will be able to go faster. This model is referred to as polarized-training. The study suggests that performing about 75% to 80% of all training sessions at an intensity below your aerobic threshold can maximize your performance, combined with a certain degree of moderate to intense training. In addition to zone 1, athletes can benefit from additional training above zone 2, rather than within it. One of the best ways to keep your speed sharp, while focusing on building your aerobic fitness, is to add in short 20 to 30-second bursts of speed, or “striders.” These can be added into the middle of a zone 1 workout, with plenty of recovery between each effort. This polarized training model not only increases speed, but it reduces the risk of overtraining due to less overall stress on your sympathetic nervous system. In terms of putting this into practice, the off-season is the perfect time of year to slow down and develop zone 1. One of the most common challenges for athletes starting to develop their aerobic fitness is the inability to keep their heart rate under zone 2, especially when running. It is important not to fall into the trap of wanting your pace to be faster and compensating by running in a higher heart rate zone. Developing zone 1 requires patience, which is why you should start now. If your heart rate is excessively high, it may require mixing in some walking intervals in order to bring it back under your aerobic threshold. For more fit athletes getting back into training, begin this process by focusing on RPE (rate of perceived exertion). Make sure that your effort feels easy (yes – to the point of embarrassingly easy). When you feel your fitness coming back around, then pay attention to your heart rate staying in zone 1. Even though it seems counterintuitive to train at a slower pace than you intend to race, staying disciplined and getting comfortable in zone 1 will have a significant effect on your race results. * International Journal of Sports Physiology and Performance, 2014, 9, 332 -339 https://dx.doi.org/10.1123/IJSPP.2012-0352 © 2014 Human Kinetics, Inc.
Coach Laura Marcoux knows that ultimately, the road to winning in triathlon isn’t about the numbers. It’s about exploring new horizons, redefining limits, and becoming the best you can be (the results will fall into place!). It isn’t meant to be easy, and isn’t always fun, but with consistency and that “can-do” attitude, I can guarantee you that it will be worthwhile! 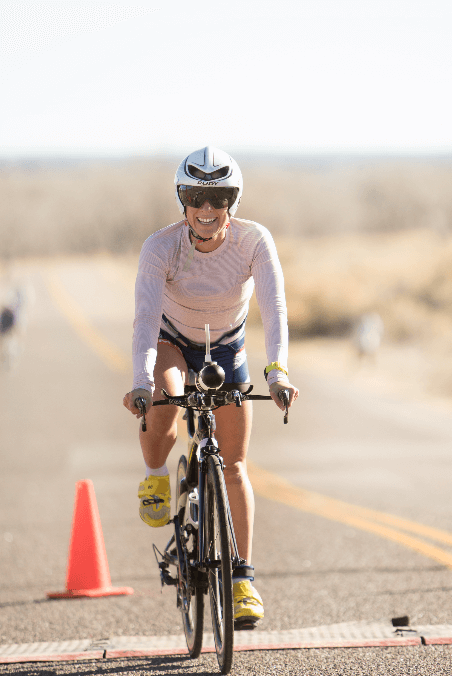 Laura is a USAT Level II Certified Coach with additional credentials to guide you toward an incredible race experience.